Thunder Canyon Brewery emphasizes not only the universality of beer as a drink of choice for adults, but also the diversity within the drink. "Beer is as diverse as it is universal." In honor of Beer Week this past month in Tucson, Thunder Canyon Brewery sought to display some of the favorite beers in each state. To do this, they asked Nuanced Media to create a fun collage turned infographic, with each state projecting the label of a beer that many of its citizens hold near and dear. Thunder Canyon Brewery wanted to emphasize not only the universality of beer as a drink of choice for adults throughout the US, but also the diversity within the universally accepted drink. Like the diversity of people in the United States, even on a state-by-state basis, the same can be said for the beer preferences in each state. The accompanying article discusses popular choices in the states of Alaska, Colorado, California, and Idaho. 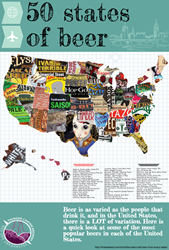 The infographic also lists the beer chosen for each state below. The brew representing Arizona happens to be the Copperhead American Pale Ale. With more than 40 beers on tap, Thunder Canyon Brewery has one of the largest draft beer offerings in the Tucson. Along with 12 handcrafted TCB beers, we also include a large catalog of local and national microbrews on draft. Thunder Canyon Brewery is Tucson’s most award winning brewpub. One of the area’s first breweries, customers flock to TCB for our award-winning handcrafted beers and fresh, homemade cuisine. The lively, family-friendly atmosphere makes TCB a welcoming spot for people looking for great beer, great food, and a great time. For more information and hours of operation, please visit http://www.thundercanyonbrewery.com. Nuanced Media is a digital marketing and graphic design firm. The company specializes in strategic, multilayer marketing campaigns and efficiently crafted, user-friendly websites. Based in Tucson, the company has a variety of clients throughout Arizona, California, and Texas. For more information, please view Nuanced Media.